The Classic Vietnam tour takes you to all the major sites Vietnam has to offer as well as some more remote locations such as Sapa with its array of colourful hill tribes and unique wildlife to the better known romantic sounding perfume river and the forbidden citadel of Hue. You’ll be met at the airport and transferred to your hotel in Hanoi to check in with the rest of the day at leisure. Vietnam’s charming capital was founded in 1010 by Emperor Ly Thai To and rests on the banks of the Red River. Soviet style buildings can be found alongside French colonial villas and make for a fascinating blend of architectural styles. Wander through the Old quarter with its winding alleys, crowded markets and traditional shop houses and take in some history with a visit to the Temple of Literature and the One Pillar Pagoda before paying your respects at the mausoleum of the man who led the country to independence, Ho Chi Minh. Then perhaps take a well-earned break and chill out in one of the many cafés beside Hoan Kiem Lake and watch the world go by. The train arrives in Lao Cai where you will be met and driven to your hotel for breakfast before setting off to visit Lao Chai village, Home of the Black Hmong hill tribe. We walk from Lao Chai to Ta Van - the only village in the Sapa valley. In Ta Van you enjoy a delicious lunch prepared by our local guide in a village house. After lunch the trek continues through the bamboo forest before reaching Giang Ta Chai, where we have the opportunity to meet the Red Dao people. You return to your hotel for check-in with the remainder of the day at leisure. Rising to the sounds of a dawn chorus you take breakfast before heading out for a visit to the spectacular and very colorful markets of northern Vietnam. Here you have the opportunity to see hundreds of local people in their traditional attire busily buying and selling the local produce. This is golden opportunity to learn more about hill tribe transactions as well a great chance to grab some amazing photographs. In the Afternoon we have a pleasant walk to THE Flower H’mong village of Banpho before transferring back to Sapa. From Sapa the round trip takes between 8hrs-10 hrs. Day at leisure until you board the Express train back to Hanoi. 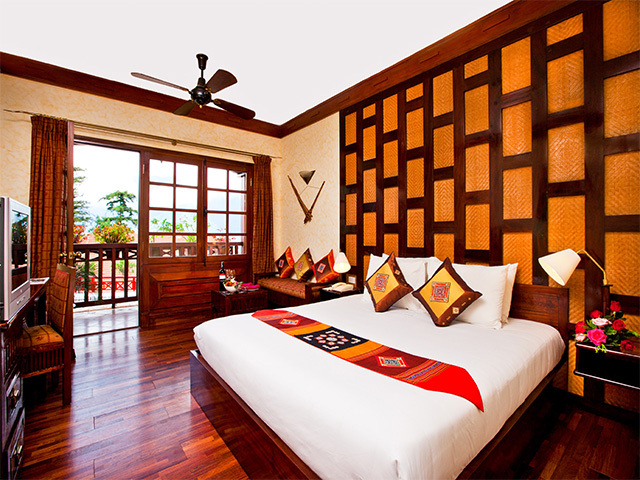 Your free to explore Sapa or make full use of the facilities at the Victoria Spa resort before your taken to the station for your overnight journey back to Hanoi. 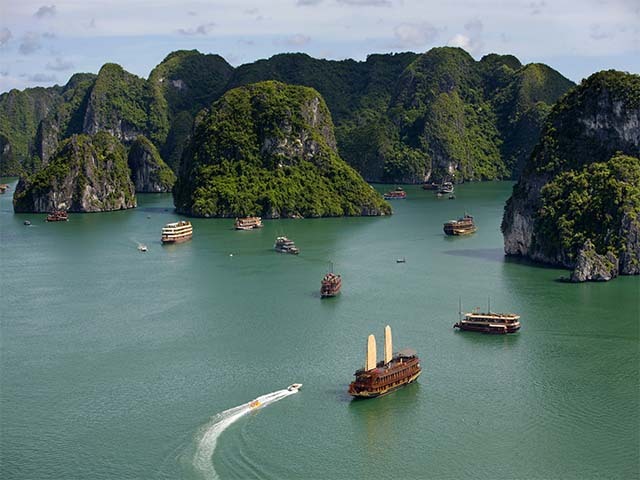 Arrive in Hanoi and transfer to Ha Long Bay for your cruise. You arrive in Hanoi early and transfer to the hotel for breakfast and to freshen up before the drive to Ha Long Bay of around 3.5 hours. Arriving by noon at the quayside, you board your luxury junk where a welcome drink awaits you. After settling into your room you can enjoy a delicious seafood lunch while cruising through Bai Tu Long bay. Later you have the opportunity to go trekking or swimming at Soi Sim Island. The cruise continues on to Hang Doi water tunnel which is reached by rowing boat before you dock for the night at around 18:30. Dinner is served on board in the dining room. Wake early to catch the sunrise over the bay and enjoy a Tai Chi demonstration on the sun deck with a cup of coffee or tea in hand. You set sail for the splendid Sung Sot grotto and a glimpse’s of a nearby fishing village before heading back to Halong bay with brunch served on route. You arrive at the pier around 11am and drive back to Hanoi with a stop en route in the ceramic-making village of Phu Lang to observe the centuries old method of ceramic production (Time Permitting). Then you’re transferred back to the Hanoi airport for the evening flight to Hue. On arrival, meet and transfer to your hotel for check in. After breakfast you take a boat upstream to visit the Thien Mu Pagoda, Hue’s most preserved religious monument standing on the riverbank at seven-floors tall. Then you’re driven to the Imperial Citadel with its high pitched roofs of red & gold and the Forbidden Citadel. Afterwards you enjoy a home cooked lunch at the restored Royal home of Ms. Vinh Tu. 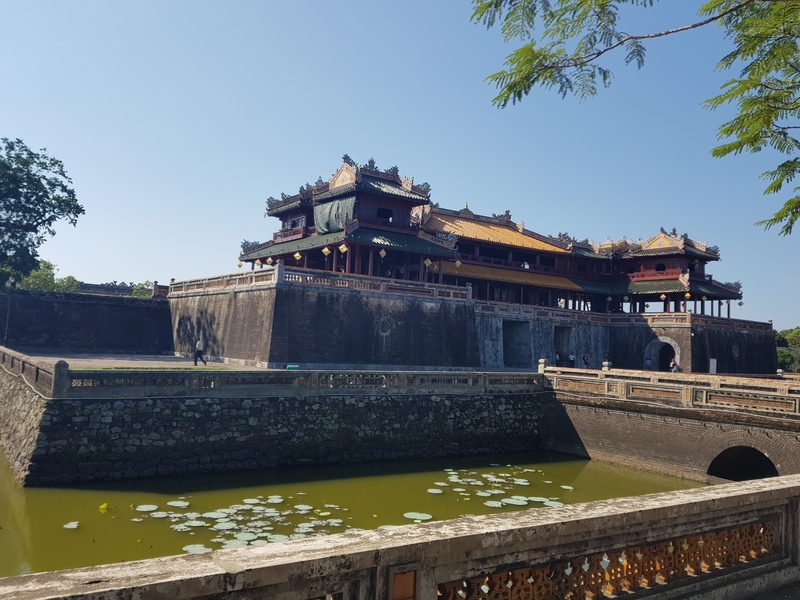 The afternoon gives you the chance to visit the elaborate Tu Duc Royal Tomb which was designed to blend in with the natural surroundings and the Khai Dinh Royal Tomb with a very different architectural atmosphere that has elements of eastern art mixed with western designs. At the end of your day’s tour you are driven back to the hotel in time for dinner and the rest of the evening at leisure. After breakfast you’re taken to visit Bach Ma National Park before departing for Hoi An on a 3 to 4 hr journey. On route you stop at the Lang Co fishing village located on a sand dune which is a great photo opportunity. We continue your scenic drive over the Hai Van Cloudy Pass with its spectacular panoramic views of the coastline before continuing on to the ancient town of Hoi An and its eccentric mix of western and eastern-influenced architecture. You will be transferred to your hotel on arrival and have the Rest of the day at leisure. Your day starts with a walking tour through the ancient streets of Hoi An followed by a cooking class at Ms Vy’s restaurant. Ms Vy’s is a family run restaurant in Hoi An, called “The White Lantern” and her dishes have been handed down from generation to generation and are quite famous among the locals in Hoi An. In the afternoon you enjoy a walk through the Ancient Town of Hoi An with its former merchant houses that are a combination of Vietnamese, Japanese and Chinese style; the 400 year-old Japanese Covered Bridge constructed in 1593 and the Sa Huynh Museum located near the Japanese covered Bridge. In the afternoon you enjoy a two hour boat ride on the Thu Bon River where you’ll see the ship building village of Kim Bong before heading off to visit Thanh Ha to see skilled locals at work producing beautiful pottery. 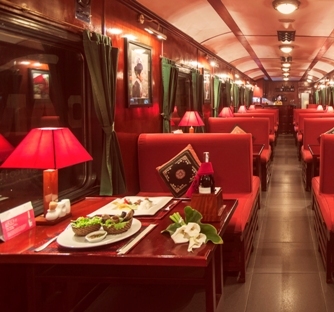 After breakfast you will be transferred to airport for the flight to Ho Chi Minh (Saigon). Arrive at Saigon meet your guide at the airport for transferring to the hotel. The rest of the day is free to explore the city. You start the day with a visit to the Cu chi Wildlife rescue centre. This is the first multi-species wildlife hospital and holding facility in southern Vietnam. Its main purpose is to help FPD staff to enforce the law by providing accommodation and care for wild animals that have been confiscated from illegal traders while raising public awareness of the importance of conserving Vietnamese endangered wildlife. In the afternoon you visit Saigon and the Notre Dame Cathedral before visiting the Former Presidential Palace and War Remnant Museum to get a feel of Vietnamese history and people. We end the day by visiting the Saigon’s Binh Tay market and Thien Hau temple built by Cantonese Buddhists at the end of 18th century before heading back to your hotel. Today you’ll be taken to Saigon airport for your return flight to Bangkok. Where upon you may connect with your onward flight home.